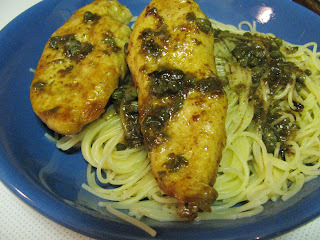 One of my favorite Italian dishes is chicken piccata with angel hair pasta. I love the light tangy sauce with the delicate noodles, and for this picky chicken eater, the scaloppine is usually so tender that I forget I'm eating chicken. 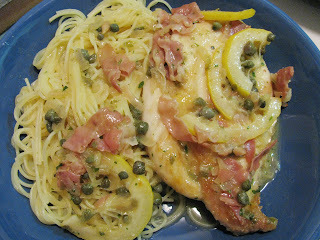 I vowed to try to make chicken piccata this year, and I have. I found the first recipe over at the Food Network courtesy of Giada de Laurentiis. Our entire family really liked the flavor, but the sauce turned out really brown and ugly, and truth be told, it used just a little too much fat for my liking (6 whopping Tablespoons of butter and 5 Tablespoons of olive oil). *I made a couple of minor changes: pounded the chicken thin before cooking and used extra virgin olive oil instead of vegetable oil. **Just out of curiosity, I decided to plug the recipes into Calorie Count's Recipe Analysis program to see how they compared. 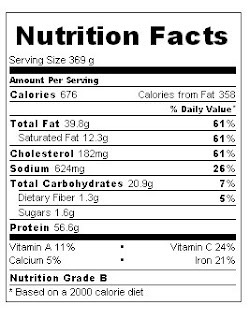 (I knew both would be high in calories and fat, but we don't eat it that often to be really worried about it.) 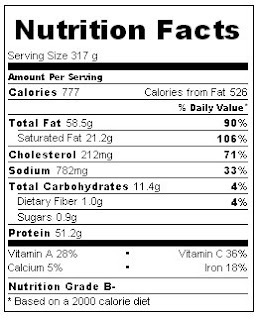 As expected, Giada's was higher in calories (by only 100 or so), but much higher in fat content (not that Cookography is going to win any low-fat cooking awards on this one!). I used extra virgin olive oil instead of vegetable oil, and it lowers the saturated fat percentage by 5 percentage points. I don't know if I've ever had piccata either! (reading Lori's comment) I've heard it's really easy and feels fancy though. Love "Guadalahut" as a name. That is quite witty! Chicken piccata is really very simple...probably something I'll make on a weeknight when I return to the States and to work. And it's really a no-brainer in my family because my daughter absolutely loves lemon-flavored things. It's one of the few meals we eat that I don't have to beg her to finish her meat. You know I must have fallen off the blog follow list when blog had those problems a few weeks ago and just saw you on another blog...I have missed talking with you and this dish looks great!